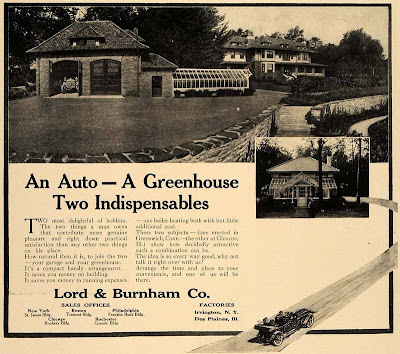 A 1913 Lord & Burnham advertisement for a joint garage and greenhouse designed to combine "the two things a man owns that contribute more genuine pleasure and right down practical satisfaction than any other two things on his place". "In the early days of greenhouse construction - long before aluminum - greenhouses were made of iron and cypress wood from the Florida swamps. Lord & Burnham owned extensive cypress groves throughout Florida; when these were exhausted by the 1930s, L&B turned unsuccessfully to redwood, before employing the aluminum frames used today." The photo of the garage is somewhat bizarre. The apron of the garage seems to lead only to lawn. There is no obvious drive, nor is there any turnaround. Moreover, there is a retaining wall in the foreground with a stone staircase. Perhaps the Hupmobile was transported to the street by hot air balloon? The entrance into the garage is on the backside as seen in the smaller shot. Anonymous question for you - As a registered user at this Blogger site I have the option of checking a box to receive email updates when there are any further posts after mine. As a anonymous user does that option show up for you? Zach, do you have a date for this ad as you did for the first two? I am interested in when the outbuilding was designated as a garage instead of a carriage house. Half, the email follow-up only goes to the registered users. Google knows everyone's email, but the follow-up template is not set-up to send you the info without you supplying your email address. My mistake on the garage BUT you can clearly make out opposite doors for egress into the structure. 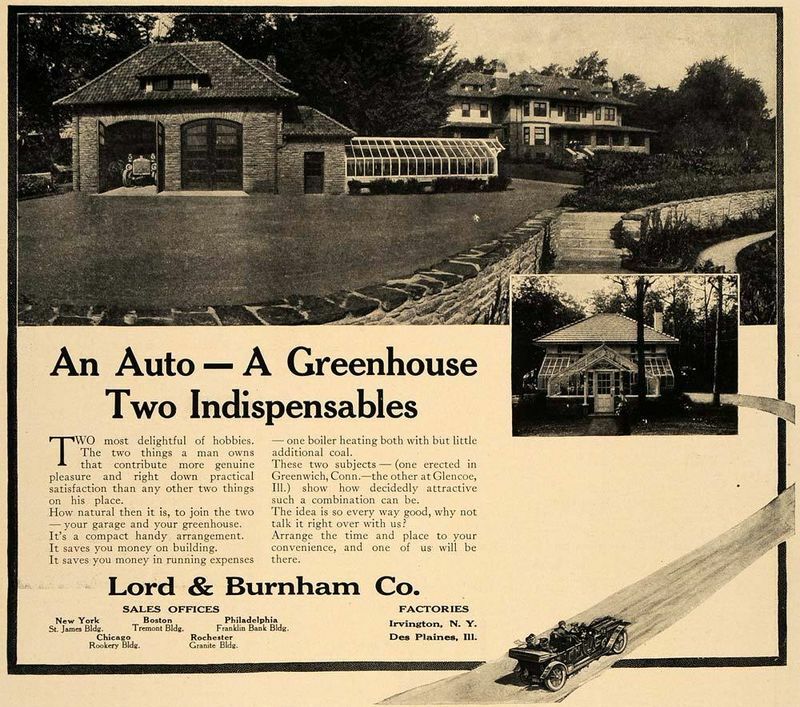 Does anyone know of a property today that still has an L&B greenhouse and garage? I suspect they offered an array of styles for the garage but perhaps not. The garage in the ad draws heavily, although I'm biased, from the architecture of Harrie Lindeberg and would fit with many of his rough stone facade and tiled roof. in the country life you offered on page 20 left hand side is a picture of High St in Hingham Mass ( founded in 1635). i passed that way this morning and can gladly report that those several Cape Cod type homes are still there, little modified and present a street scape unchanged in over 200 years. would it be the same all over the rest of town, but for a town of the size, and age of Hingham change while coming is slower than in other places. another interesting point in those couple of articles is that they continue to mention homes of easily twenty five hundred square feet as little, not at $200.00 a square foot to build.